MediMiss effective eye care eye exercises eye care Natural Remedies Optical Eye Care Is Your One Eye Stronger Than the Other? What's strabismus? If you run into the condition that one eye sees clearer than the other, you are in great danger of strabismus. At that time, you may probably use the stronger eye more often. As a result, the stronger one will turn bad gradually. Meanwhile, as the weaker eye is not used quite often, its muscle becomes beef-witted and being out of good use. So you unconsciously see with the stronger eye only. The process will come into a vicious circle and your eyesight can be badly damaged in the end. How to know whether you're strabismus or not? The test is quite simple. Cover one eye and see a fixed object, then change to cover the other one. 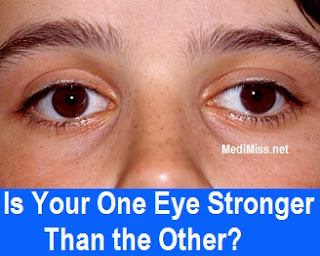 Compare the effects of the two eyes when seeing and then you can determine which eye is weaker. There're many physical ways to improve vision, but perseverance is the biggest factor leading to good eyesight. So you should always keep your eyes out of tiredness. We list some simple exercises as follows, and you can choose one or two to do it every now and then. 1. Hold a pair of crossed chopstick, and see from one side of the horizontal chopstick to the other side, then back to the intersection. Browse straightly to the top of the vertical chopstick and down to the bottom. Repeat them seven or eight times. This exercise is quite good for muscles relaxing. 2. Take two chopsticks in the hands, one is three inches directly away from your nose and the other is at arm's length. Move the farther stick towards your eyes, and keep attention on it. You can see the closer stick to separates into two. So is the same effect to the closer one. Do the exercises for a few times one day, and you can improve your vision. 3. Some ball games like table tennis are also beneficial for making eyesight better. If you can move your eyes every now and then, muscles can of course be trained well. 4. Brain plays a great role, too. You'd better reminisce or imagine object with your brain as if you are seeing with eyes. It will reduce the task of eyes. Say that in another way, eyes can be protected to some extent.